Fred Frith's move to the USA at the end of the 1970s was the start of an incredibly productive phase of his career; between 1979 and 1982 he wrote 2 albums for Art Bears, 2 solo albums, wrote and recorded with Aqsak Maboul and Henry Kaiser, appeared as a guest on albums by the Muffins, the Residents, Lindsay Cooper, Material and Etron Fou Leloublan and also found time to create the legendary avant prog power trio Massacre. During his time in New York he had been impressed with the thriving downtown music scene (which had also invigorated Brian Eno and Robert Fripp) and joined forces with two of the hottest musicians around, Bill Laswell and Fred Maher. 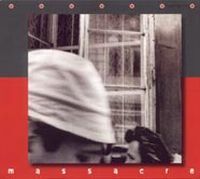 Massacre was never simply 'Fred Frith plus rhythm section' but a genuine meeting of equals. Laswell and Maher had been around the new wave/no wave scene and were as influenced by funk and dub reggae as they were by rock music, and they had also both played with Daevid Allen in New York Gong. The collision of these styles with Frith's RIO approach yielded musical results that sound as fresh today as they did over 25 years ago. The power trio line up, stripped down sound and stop-start arrangements are all deployed to great effect, with the three musicians evenly balanced in the mix. The playing is incredibly tight throughout, with some of the pieces sounding carefully composed and others sounding more improvised. Fred Frith uses a world war 2 fighter pilot's throat mike to add some bizarre and slighlty disturbing vocal sounds here and there, and there are a couple of sound collages punctuating the album, but for the most part there is little studio trickery in evidence. Highlights include the RIO/funk/punk masterpiece Legs and the lengthy Corridor/Lost Causes/Not The Person We Knew, where each section features one of the three musicians taking the lead. The CD reissue contains the entire vinyl release plus numerous live recordings which almost double the original playing time, but the sound quality is excellent throughout and the extra tracks add to the power of the original. This was a hugely influential album, and echoes of it can be heard today in bands like Ruins, Korekyojin and Forever Einstein. It's also an album to treasure for Fred Frith's brilliant guitar work, which is not always this prominently featured. It's an essential document of RIO colliding with post punk noise, with extremely enjoyable results - as it says on the label: PLAY IT LOUD! Highly recommended.